Microsoft has officially launched Internet Explorer 9. The browser, which is being touted by many reviewers already as the best version of the software the company has ever released, follows a long line of predecessors that at times won customers over and at other times failed miserably. But it’s a new day for Microsoft and Internet Explorer. The time has finally come for the company to face Google’s Chrome browser head-on. But perhaps now Windows users are wondering if they should use Internet Explorer 9. Some of those folks are using previous versions of the browser and might be pleased with it. Others might be using Chrome, Firefox or Opera, and couldn’t fathom the thought of moving to Microsoft’s latest browser. CED Solutions, the #1 location for Microsoft Certifications in North America, provides certification training for Windows 7, Windows 2008 R2 Server, Exchange 2010, Sharepoint 2010, and many more. The clear truth is every single Web user regardless of the browser they’re using now should try out Internet Explorer 9. It’s speedier, more user-friendly and has enough additional improvements to coax any user to download the browser and use it. Read on to find out why consumers and enterprise customers should start browsing the Web with Internet Explorer 9. One of the biggest issues with previous versions of Internet Explorer was the browser’s design. It was ugly. Rather than put the browsing experience first, Microsoft forced users to deal with too much clutter around a Web page. That’s gone, finally. 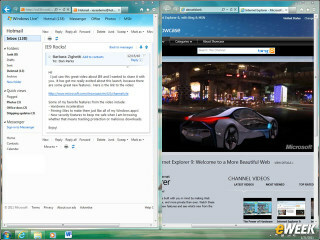 In Internet Explorer 9, Microsoft has created a clean, simple interface that puts browsing at the core of the experience. It’s nice to see. It’s obvious after loading Internet Explorer 9 that Microsoft took some cues from Google. That company’s Chrome browser features the simple, slimmed-down design that Internet Explorer now features. It also has the Omnibox that lets users input Web addresses and search the Web in one place. Microsoft’s option, which performs the same action, is called One Box. Plus, Chrome’s appeal is speed. But as noted above, it looks like speed might be a key feature for Internet Explorer 9 as well. Microsoft has the luxury of being the company that not only designs the browser, but also supports the operating system it runs on. Because of that, it was able to bring Pinned Sites to Internet Explorer 9. That feature lets users save their favorite Websites to the Windows 7 Taskbar for easy access. Pinned Sites are similar to launching applications on the desktop. It’s a nice service. Microsoft knows that its Achilles’ heel is security. To address that problem in Internet Explorer 9, Microsoft has brought several security features to the browser that address three main issues: attacks designed to hit the browser or operating system, exploits through Websites and “social engineering” attacks. One of the key aspects of that effort is the company’s SmartScreen Application Reputation. The idea behind the new feature is to reduce annoying warning prompts, but analyze files and make users aware when a download is potentially malicious. Microsoft claims 95 percent of malware that previously went unnoticed was discovered with this new warning system. Not bad. Currently, Microsoft is doing its best to get the world off Internet Explorer 6, the browser that arguably damaged its reputation in the security space more than any other. But perhaps Microsoft should also acknowledge that Internet Explorer 7 and Internet Explorer 8 weren’t much better. They were slow, lacked proper support for emerging Web standards and proved to be less secure than users would have liked. Internet Explorer 9, at least right now, looks to be the browser that its predecessors should have been. This factor should make it all the more appealing to current Internet Explorer users. The corporate world will find quite a bit to like about Internet Explorer 9. Aside from the fact that the browser loads Web pages faster and comes with more security features, it builds upon previous Group Policy support. In fact, it comes with some new features, including Group Policy settings, that will let IT staff take control over all facets of the browser before they send it off to employees. All told, Microsoft says IT professionals will find close to 1,500 Group Policy settings in Internet Explorer 9. Over the years, Microsoft’s Internet Explorer has been panned by critics for not seeing the changing times. It has been behind on Web standards, security, speed and much more. But this time around, Microsoft seems to acknowledge that it doesn’t necessarily have all the answers that it once thought it had. It realizes that the competition in some cases is doing something special in the browser market. Internet Explorer 9 is a reflection of that. In many ways, it’s a compilation of some of the better features found in other browsers, combined with new options exclusive to the software giant. The new face of Microsoft might just pay off for Internet Explorer 9 users. As an increasing number of people turn to the Web to do, well, everything, tracking is becoming a greater concern. It’s now open season when it comes to tracking Web users. Realizing that, Microsoft has added Tracking Protection to Internet Explorer 9. The feature lets users employ Tracking Protection Lists that block content that might be used to track Web use. In addition, the browser includes a “Do Not Track User Preference” to further bolster the anti-tracking efforts. If tracking is a concern for Web users, Internet Explorer 9 might be the best solution yet. It’s important to note that Internet Explorer 9 is available to Windows Vista and Windows 7 users, but not those running Windows XP. On one hand, that might be a problem for enterprise customers and consumers using the old operating system. But perhaps it’s a good thing. Internet Explorer 9 could be another good reason to ditch XP for Windows 7. After all, XP’s days are numbered and Windows Vista is a non-starter for PC users. The time has come to switch to Windows 7. And using Internet Explorer 9’s vastly improved experience as another good reason to do that is a smart idea.